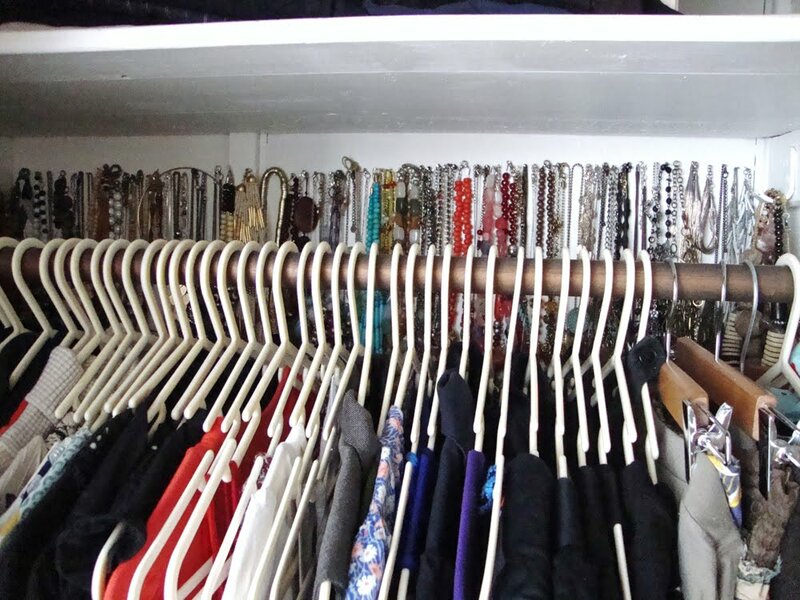 B U B B L E G A R M: How to make the most of your closet space! That's a really good idea for storing your neckalces, mine are all lying in a pile! I have some nails on the inside of the doors of my wardrobe and I put my necklaces there. How do you get to yours? Do you just push the hangers to one side to get the back I guess? Removing the door is such a clever idea. 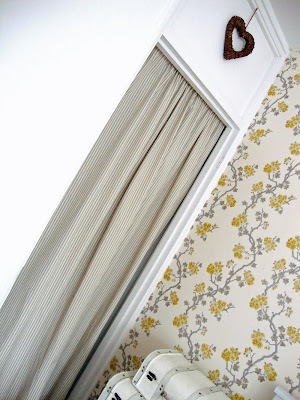 I love the curtain and your wallpaper! 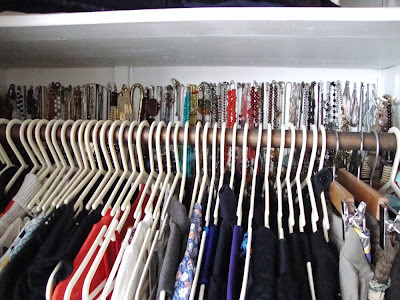 Some clothes which I always wear together are put on the same hanger, sort of like a ready made outfit, to save space! You've inspired me to update my closet. we have a small closet too and the majority of it are my clothes. I love what you did with the necklaces -- might have to give that a try. Ugh this reminds me I have to clean out my closet from summer to winter clothes. Amazing amount of necklaces, I love earrings instead. Great tips! removing the doors is a GENIUS idea!! love it! Thanks for this post Muhsine, I also have a small closet,and have soo many necklaces, so this really helps! Really good idea, and so organized! I love how you've organised your necklaces! Grest idea, I need to sort mine out! Love the closet idea....I need somewhere to store my necklaces..
looks fantastic & its a great use of space!! I love this, my wardrobe is no way organised as much as this. You inspire me to sort it out!!! Thanks for the posts, keep them coming and hopefully your organisational skill will help me reorganise our house haha! i like the fabric that you used in place of the door! i don't know that i have many good closet tips--i'm one of those who uses only wood hangers, yet gets upset with how much room they consume. What a cleaver idea! I am currently in the process of figuring out a new makeup storage setup since I have outgrown my old storage system ;) I <3 your blog. 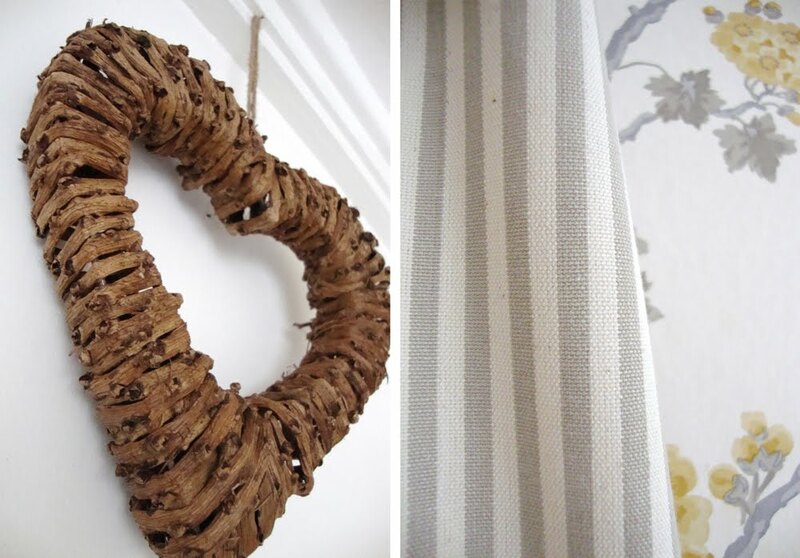 I think you should have a seperate blog for interior designing. :) You have amazing ideas. Thanks for sharing them. I do the same for my necklaces but I hang them on a Tie hanger... can you show how you organize your other jewlery ;) Love your blog!! Sadly, my closet is..rented (& lined with wooden panels), so I can't really create holes, however I 've thought of building a frame display for my necklaces and earrings, hopefully I 'll get to it someday!